Iowa Senator Joni Ernst says she doesn’t know what the final outcome will be for the North American Free Trade Agreement (NAFTA), but she believes talks with President Donald Trump on the issue were productive. 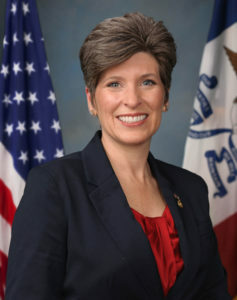 Ernst says it was insightful from her personal perspective to talk with the president as she says he is “really concerned that we are doing better.” Ernst, a Republican from Red Oak, and Iowa’s other Senator Chuck Grassley have expressed support for the trade agreement with Canada and Mexico based on its impact on our state. Ernst says she was glad to be able to explain her thoughts on the issue. “Providing him the information about where we have been so successful through agriculture, I think it really enlightened the president,” Ernst says. “Am I hopeful, of course I’m hopeful, I am optimistic because I think he heard at least from those of us present a side that hadn’t been presented.” The president has has made repeated critical comments about NAFTA and its impact on trade. Ernst says the president asked them to name one senators who wants to get rid of NAFTA and they all agreed that while there or provisions that some don’t like, no one is calling for it to be thrown out. “I think the president was under the assumption that all of the senators would want to rip up this NAFTA agreement and start from scratch — and that’s not true,” according to Ernst. She says she believes the discussion changed Trumps mind a little bit, but she isn’t sure how the negotiations will end up. “It is his decision, but at least we will have done our absolute best in educating the president in all aspects of the NAFTA agreement and how beneficial it has been,” Ernst says. She says she would love to have a follow up conversation with the president if he has any additional questions as they move into the next round of NAFTA negotiations.